WT Landscape Architect, Michele Richmond, writes about her innovative approach to planting design for the Othello Square projects in a recent article on ASLA’s Blog, The Field. The careful selection of low allergen plant species reflects the project goals to welcome and support the community. This article was originally featured in the ASLA Blog, The Field on February 19, 2019. Today, more than 50 million people in the US have allergies and asthma [i], including hay fever and respiratory, food, and skin allergies that can come from plants in our landscape. Allergies can be a onetime event or a constant reaction to pollen. Currently, allergies are the sixth leading cause of chronic illness in the US, resulting in 200,000 emergency visitsa year [ii] and costing more than $18 billion annually [iii]. In Washington State, asthma is the most common chronic illness for low-income children. Asthma cases have doubled in the population at large and quadrupled among low income families in the last thirty years [iv]. As landscape architects, we can make plant choices to minimize allergy potential. According to Thomas Ogren in The Allergy-Fighting Garden (a fantastic resource), more than 130 possible plant factors can cause allergies including: the amount and potency of pollen, bloom duration, size of pollen grains, degree of pollen grain stickiness and dryness, and whether the plant is perfect flowered, monoecious, dioecious, or polygamous, etc. [vi]. 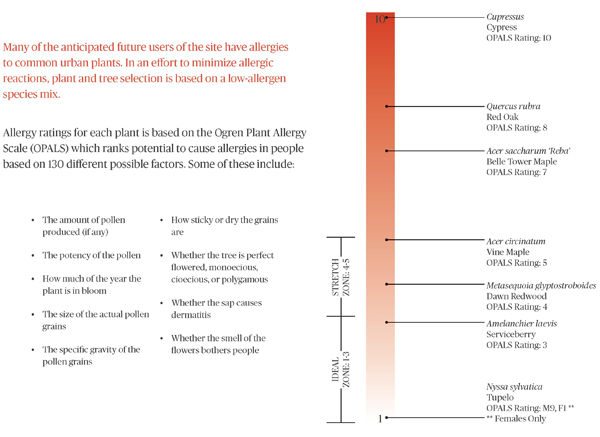 We chose to use the Ogren Plant Allergy Scale (OPALS) [vii] because it clearly explains the degree of allergenicity for each plant to our clients, their patients, and the public. OPALS is also used by the American Lung Association and the USDA Urban and Community Forestry Program. Additionally in this project, we needed to increase biodiversity on our site and build pollinator habitat. 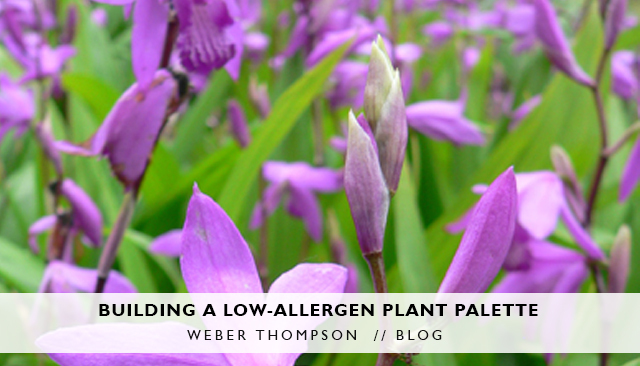 A low-allergen plant palette can negatively affect pollinator habitat. We actively sought to maintain biodiversity and pollinator habitat in our plant palette for three reasons. First, it is essential to support urban ecology on every level. Catering only to people in choosing plants is a disservice to everyone. Early life particle exposure reduces the likelihood of developing an allergy to that particle [viii]. Second, there are many plants that support pollinator habitat that will not negatively impact allergies. These plants may not be in every nursery, but with a little searching you can find them. Third, exposure to diverse and mixed pollen reduces the impact of the one or two grains the individual typically reacts to. Much of the native Pacific Northwest (PNW) palette is poor for allergies. Spores from common PNW ferns cause negative skin reactions. Also harmful to people with allergies are many evergreen trees as well as many species of the Acer, Quercus, and Liquidambargenii which, in Seattle, constitute one-third of the urban canopy. 1. Green Factor – In Seattle, most new buildings need to comply with the Green Factor, a code designed to increase the amount and quality of landscape, reduce stormwater runoff, provide habitat for birds and insects, improve the look and feel of a neighborhood, and cool cities [ix]. Achieving the specific code-required score is an overarching consideration. 2. Planting native and/or adaptive species – Plants ill-suited to their location will attract insects, mold, and diseases. Insect dander is one of the worst offenders for people with allergies. Choosing the right plant for the right place is essential to creating a thriving low-allergen landscape. 3. Increasing biodiversity and supporting pollinator habitat – We are relying heavily on perennials that bloom throughout the year to supplement our core, low-allergen evergreen and deciduous woody shrubs. Specific cultivars of Pennisetum purpureum, Bletilla striata, and Passiflora edulis support pollinator habitat without causing allergies. Perovskia atriplicifolia, one of the best low-allergen plants, is standard in our rotation of perennial pollinator species. 4. Airflow – Airflow around plants reduces mold (and allergies) particularly in Seattle where landscapes rarely dry out between November and June. Smaller plants spaced slightly further apart battle against mold in our landscape. 5. Plants ranking 1-5 on OPALS – We chose plants ranking between 1 and 3 (low allergen) on OPALS (with a few 4’s and 5’s). A score of 1 is the best for allergies and 10 is the worst. Many are female cultivars, perfect flowered species, monoecious, or the female plant of dioecious species. Choosing low-allergen plants is a same-cost solution to dealing with this specific community’s health issue onsite. 6. Ethnobotanical species – Our site, located in zip code 98118 in the Rainier Valley, was America’s most diverse zip code in the 2010 census [x]. It is home to 40 distinct ethnic communities with 59 languages spoken. Many of our plants are chosen from and relate to these cultures, providing the added challenge in finding species that were adaptive or naturalized. 7. Drought tolerant plants – Seattle is both rainy (November to June) and has a yearly drought from July to October. All of our plant species need to be able to deal with both drought and constant wetness to survive from year to year. 8. Setting back 18” from building façade – To lessen the likelihood of insects and pests easily entering the building and negatively impacting indoor asthma and allergies, plants and soil are held off the building façade by 18” separated by a strip of gravel and root barrier. Along the right-of-way, this setback minimized our planting areas, further underlining our decision to include smaller plants in our plant palette. In choosing our low-allergen plants, we worked from the top down. At a city level, we worked with Seattle’s Urban Forestry Commission to choose trees that fit their species diversity goals in addition to our low-allergen goals. Across the site, our core tree palette includes: Amelanchier laevis, Ginkgo biloba (females only of the Ginkgo have been specified on our site), Halesia monticola, Maackia amurensis, Nyssa sinensis, and Stewartia pseudocamellia—a mix of native and adaptive species that are ideally located to grow best on our site. We also focused on species that are adaptive to the PNW, allowing us flexibility to choose plant species with more ethnobotanical relevance to the site end users. In some cases, we’ve chosen a different species of the same genus to allow for better plant growth in our climate. For example, with 550 species in the Passiflora genus, we were able to find the best species for our locale. It is vital, when designing for spaces frequented by medically fragile populations that the landscapes help to support the users and not exacerbate any medical issues and cause more harm. In building your own low-allergen plant palette, it is important to set up criteria for choosing plant species based on the needs of your population. i. American College of Allergy, Asthma & Immunology, Allergy Facts. ii. Asthma and Allergy Foundation of America, Allergy Facts and Figures. iii. Centers for Disease Control and Prevention, Gateway to Health Communications & Social Marketing Practice: Allergies. iv. National Center for Healthy Housing, A New Prescription for Asthma Sufferers: Healthier Homes, page 1.
v. American Academy of Allergy Asthma & Immunology, NAB Pollen & Spore Levels. vi. Thomas Leo Ogren, The Allergy-Fighting Garden, 2015, page 40.
vii. Ogren Plant Allergy Scale, Thomas Leo Ogren, The Allergy-Fighting Garden, 2015.
viii. What causes allergies? Jacque Wilson, CNN. ix. 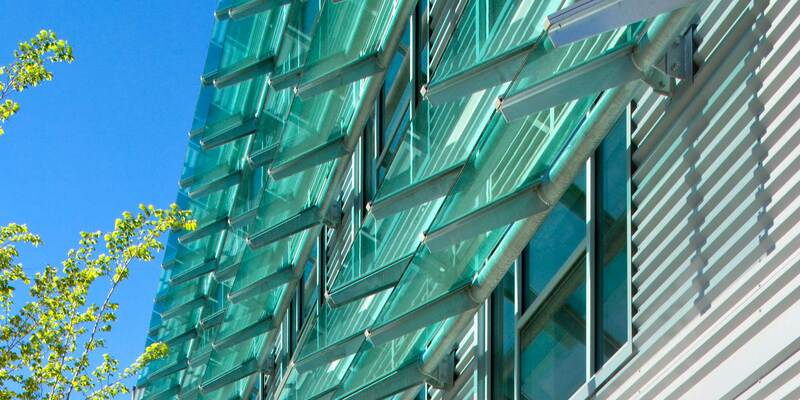 Seattle Department of Construction & Inspections, Seattle Green Factor. x. Seattle’s Rainier Valley, one of America’s ‘Dynamic Neighborhoods,’ The Seattle Times. 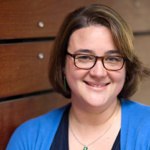 Michele Richmond PLA, ASLA, SITES® AP, LEED® Green Assoc. is an Associate and essential team member of the WT Landscape Studio and WT Sustainabiliteam. Read more about Michele on our website.